Sliced bamboo ("Nor Mai" in Thai) is found in many different Thai recipes, including Kaeng Jeut Nor Mai, bamboo with shrimp soup. Also see our street vendor video using sliced bamboo. The 24 oz glass jar allows for generous use, and this is prestigious Pantainorasingh brand--known for best quality. Some chefs use it right out of the jar, others rinse and boil it for 5 minutes first, then drain and use as desired. Ingredients: bamboo shoots, water, salt, citric acid and sodium benzoate. Product of Thailand. 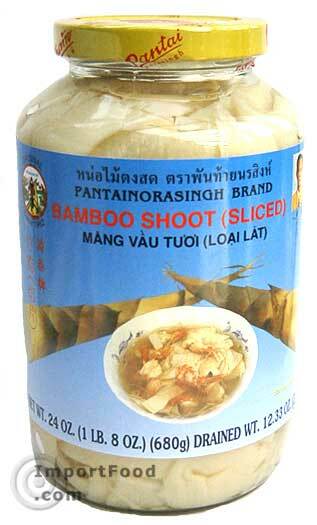 We also offer sour bamboo sliced. Lately people all over Thailand crave the Tai Pla that comes from various regions, and packed in different brands. In this recipe we show you every step in the process, also see our video feature of a chef from Trang in Southern Thailand making Gaeng Tai Pla. As authentic as it gets, and we do offer a high quality imported Tai Pla so you can make this at home using the best ingredients. Please enjoy this feature and share your comments below.